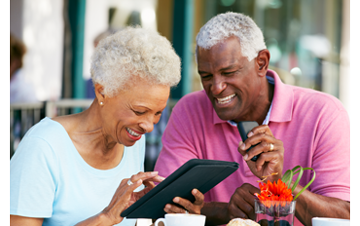 Our online investment solutions are for investors seeking smart and simple ways to save for their future. Our experts help you develop a long-term investment plan, and we provide easy access to your accounts any time of day. Traditional investment services can be expensive. Automated investment portfolios help keep costs as low as possible, so you keep more of the money you earn. Automatic rebalancing keeps you within your objective and eliminates emotional investment decisions. Tax-loss harvesting adds value by deferring tax payments and allowing you to invest the tax savings. Personal (brokerage) accounts: Individual investment account that helps you build long-term wealth (ideally) alongside a retirement account(s). Brokerage accounts are taxable, but there are no penalties for withdrawing money anytime. Joint accounts: Account for multiple owners, such as married couples or business partners. Trust accounts: Account designed to hold assets for a beneficiary (for estate planning or tax planning purposes). Retirement accounts: Including Roth IRA, Traditional IRA, and Small Business Retirement (SEP IRA or Simple IRA) accounts. Call it online investing, “robo investing,” or automated investing—we call it easy, affordable, and secure. Our portfolios (stocks and bonds) help you reach your goal—whether it’s saving for retirement or generating income now—and, our sophisticated technology automatically rebalances your portfolio to keep you aligned with your financial objectives. Advanced tax-savings strategies: With automated rebalancing, asset allocation, and tax-loss harvesting*, we’re always looking for ways to save you money. Diversified portfolios to minimize risk: We create strategically-balanced portfolios of stocks and bonds in domestic, developed, and emerging markets—to help you put your eggs in many baskets. Your assets in good hands: All HTIQ accounts are monitored by investment fiduciaries—professional advisers who are registered with the Securities and Exchange Commission (SEC) and are ethically and professionally bound to act in your best interest. Make the most of your money: With a minimum deposit of just $5,000 to open an account, modest annual fee (0.25%), asset allocation, and rebalancing at no charge, we help you get the most out of every investment dollar. Expert advice at your fingertips: Get expert advice when you need it at no additional charge. Our licensed financial experts are standing by to make sure you’re on track to meeting your financial goals. Learn more about our portfolios and how our process works. Does Your Portfolio Fit Into Your Financial Plan? A portfolio you can live with: Having the right investments are only as good as there allocation within the portfolio. Meeting your goals: Your portfolio should be designed to meet your current and future needs. Unsure if your portfolio will meet your goals: Click this simple funding analysis*. If you are not meeting your target, we can help! *Financial Planning software is provided by eMoney. E-Money is not affiliated with HT Partners LLC. HT Partners LLC does not evaluate or control eMoney planning algorithms or planning methodology. Any output provided by this tool is not reviewed or monitored by HT Partners LLC unless a client has specifically contracted HT Partners LLC for such services.